This was surprisingly hard for me to answer. I couldn’t think of a book I’ve read that was world-changing, so to speak, so I am picking a book that changed my world, particularly my reading world. That would be Pawn of Prophecy by David Eddings. This would probably not seem very mind-blowing or world-changing to most people, but it changed things pretty significantly for me. It was the first fantasy novel I had ever read and it is definitely what pulled me into the genre. I had wanted to read fantasy before, but looking at books in the bookstore was overwhelming. Everything was set in series, and even the series had multiple “series” within the series. I had no idea where to start. So this was what I picked and was immediately hooked. It was also what originally got me involved with books online. After reading this series, I really wanted someone to talk to about it, but no one around me had read it, or was likely to (although I finally convinced my mom to many years later). It led me to find the Mallorean Tavern website, which has had many incarnations since then, and was the first online forum I ever joined and where I made my first online friends, people I had never (and mostly will never) meet in person, but who I felt an immediate, strong connection with. So in that sense, this book definitely did change my world. If I was going to go with books that blew my mind, I have a few runners up: Feed by Mira Grant, Eleanor & Park by Rainbow Rowell, the Infernal Devices trilogy by Cassandra Clare, and pretty much everything written by John Green. Please let me know what books would fit this category for you. I’d love to read it! May and June . . . Graduation season. If you were to give a book as a graduation present to some eager person ready to launch themselves into the world, what would it be? This is a really hard one! There are so many things people should know as they go out into the world. I think a book that would be a good choice (if they hadn’t already read it) would be The Lord of the Rings: The Fellowship of the Ring by J.R.R. Tolkien. There are many lessons to be learned from this story. Life is a journey, one that doesn’t always work out the way you think it will. Appearances can often be deceiving. Sometimes you need to rely on other people, but be careful of the ones that you choose to trust. Most importantly, sometimes the smallest, most insignificant person can make the biggest difference. Congratulations to the class of 2015! If you have any books to recommend to the newest wave of graduates, please leave them in comments! What book would you love to see turned into a movie? Ugh, this one is so hard!! There are several books I would love to see turned into movies, but I also know that they would be very hard to turn into good movies. My first pick would definitely be The Night Circus by Erin Morganstern. That book is so visual anyway, I would love to see that adapted for the screen. Another would be Daughter of Smoke & Bone by Laini Taylor, mostly because I would love to see how they did the chimera. Lots of motion capture and CGI, I’m guessing. What books would you love to see turned into (hopefully good) movies? 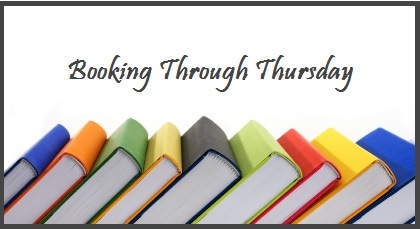 Booking Through Thursday is a weekly blog with a different bookish topic every week. This week’s topic: Author. This one makes me laugh! I’ve been trying to be an author for years. And years. And years and years. I’ve barely finished one manuscript (which I’ve been told has a lousy conclusion and needs to be completely redone) and I have another one that is maybe to the halfway point. One is a fantasy, theoretically book one of a trilogy. The other is a YA dystopian in an urban setting. I can’t really see myself writing in many other genres, to be honest. That is the stuff that I typically read the most of, so it’s what I feel most comfortable writing. Anyone else ever thought about being an author, or given it a try? What kind of book would you write? Please leave answers in comments! Decided to try out a new meme this week, just to see if Iike it. 🙂 Booking Through Thursday is a weekly blog with a different bookish topic every week. This week’s topic: Weeding. I don’t do this as much as I should. I’m a bit of a pack rat when it comes to books. Just ask my family, they’ll tell you. I have been making more of an effort to clear out books that I just don’t read any more, mostly because I need the shelf space! I have a fairly good stack of books that I’ve already weeded out for the new year, which is helpful. As far as what I do with them, I usually take them to our local used bookstore. They have a really good trade in system, which gives me store credit for the books they take. Of course, this does nothing for my efforts in clearing my bookshelves, since I usually turn around and buy more books, but it’s fun. If they can’t take the books, then I usually donate them to Goodwill. I have also donated them to our local library in the past. What about you? Anyone else have suggestions for what to do with their weeded out books? Please leave responses in comments!